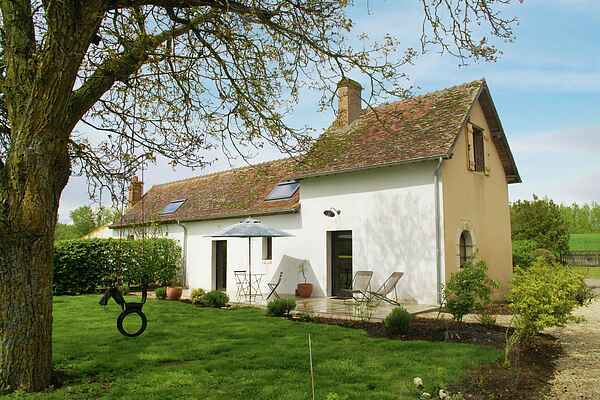 This unique holiday home, a recently renovated farmhouse, is two steps from the river Loire. Formerly part of the castle of Sully-sur-Loire. An ideal starting point from which to explore this beautiful region. New, rural interior with lots of wood detail, such as the stairs and the wonderful beams. Modern kitchen and strikingly beautiful bathroom, equipped with all conveniences. You have your own garden with terrace and bbq, from where you can enjoy the quiet and the vast view over the meadows. The children will have a great time with the swing set and rings. A kilometer further away flows the river La Sange. With two mountain bikes at your disposal you can immediately start the famous bike trail \"Loire-à-vélo\". The 14th century Château of Sully-sur-Loire (2.5 km) lies just outside your front door. The medieval village of the same name is very scenic with its boutiques, restaurants, bakery and supermarket. In Saint-Benoit-sur-Loire you can visit the impressive abbey Fleury, founded around 630 AD. A boat trip over the Briare's Canal Bridge is quite an experience. Recreation lake near Cerdon-du-Loiret (15 km). 18-hole golf course in Viglain (8 km).